Hip pain refers to pain in and around the hip area. The pain in this area can be from arthritis, weak muscles or bursitis. The hip is the largest joint in the body and when it is not working well your life can be very limited. The hip joint attaches the leg to the torso of the body. In the hip joint, the head of the thighbone (femur) swivels in a socket, called the acetabulum, that is made up of pelvic bones. 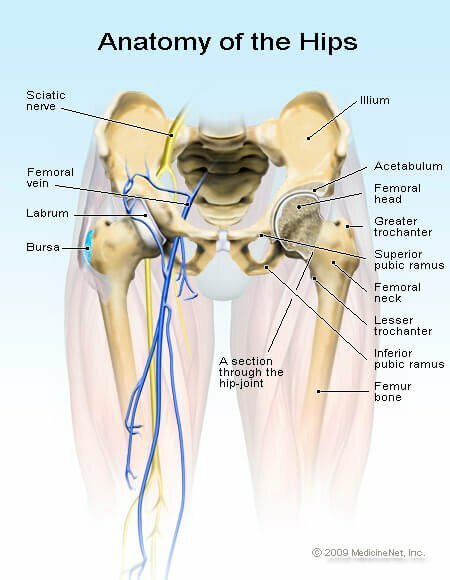 While many causes of hip pain can arise from the joint itself, there are numerous structures surrounding the hip that can also be the source of pain. Trauma is often the cause of hip pain, but any source of inflammation may cause pain in the hip area. Pain is one of the symptoms of inflammation, along with swelling, warmth, and redness; together these are signals that a problem may exist. When do you need to call us about your hip pain? What are the best treatments for hip pain? Treatment depends entirely on the cause of the problem. Therefore, it is of utmost importance that you understand the cause of your symptoms before embarking on a treatment program. If you are unsure of your diagnosis, or the severity of your condition, you should seek medical advice before beginning any treatment plan.